A Norton original in the Reacting to the Past series, Kentucky, 1861: Loyalty, State, and Nation pulls students into the secession crisis following Lincoln’s 1860 election. 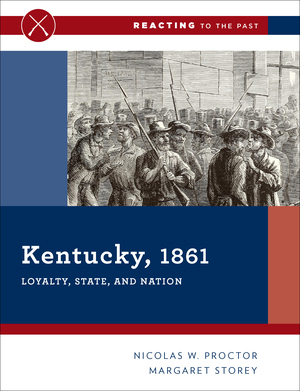 During a special session of the Kentucky legislature, set against the looming threat of violence, students grapple with questions about the future of slavery and the constitutionality of secession. Students participate in active learning when they are part of the game. Each student receives a game book, which outlines the historical context, game premise, central debates, rules, and readings. Students take charge of their own learning by assuming roles in a game they will want to win. They must adhere to the beliefs and worldview of their historical figure, but they are not limited by a script. They must devise their own means of expressing their ideas in speeches, presentations, or other public actions. With clear organization and helpful instructor resources, playing the game is easy. Each Norton original game book has a clear five-part structure. This organization brings a much-demanded consistency to the series, and makes it easy for instructors to teach multiple titles in succession. The Gamemaster’s Materials required to run each game are similarly helpful and well-organized. Students develop history skills such as primary source analysis, public speaking, writing and argument, critical thinking, problem solving, leadership, and teamwork. For its innovative approach to teaching and learning, the series has been supported by organizations like the Teagle Foundation and the U. S. Department of Education. The series was developed under the auspices of Barnard College, and the Reacting Consortium has created a national network of enthusiastic instructors who share their teaching experiences through regular conferences and social media.